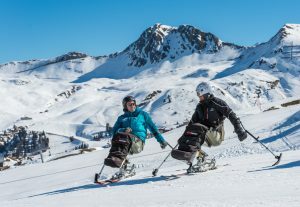 La Plagne is known for being one of the best ski resorts adapted to the needs of disabled skiers. The lift company has taken it upon itself to improve access to the ski lifts for people with reduced mobility and have increased their capacity to be able to accommodate several disabled skiers at any one time. Thanks to companies like Oxygene, who offer lessons in sit skis, taxi skis and supported stand-up lessons, adaptive skiing has grown significantly in La Plagne. Oxygene has some of the most experienced adaptive ski instructors, amongst whom, Julien Favre is one of the best known. 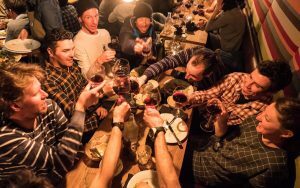 Thanks to his knowledge and the advice of Emmanuel Senin, president of the Planet Handisport association, and Bastien Perret AKA Magic Bastos, we have pulled together this article listing all the information you need to be able to enjoy a fantastic, stress-free adaptive ski holiday in La Plagne. Upon your arrival you will have the choice of plenty of disabled parking places and, if there aren’t any spaces available you can park in any of the resort’s official car parks for free with your disabled parking badge. Here is a map of the car parks. 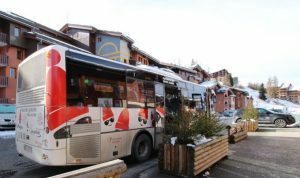 Once in resort getting around La Plagne without a car is very straightforward thanks to a free shuttle bus service that runs all season, every day between 8am and midnight (around Plagne Centre, Belle Plagne, Villages, Bellecôte, Plagne 1800, Aime 2000 and Bobsleigh run). If required, there are two nurses who work in resort and with whom you can book home-visits. You can organise these appointments in advance of or during your stay by contacting them directly. They are Virginie Marchand Maillet and Gaëlle Louvet, telephone number +33 (0)6 09 72 60 37, and email addresses : ninie.73@hotmail.fr and louvet.gaelle@gmail.com. Pierre et Vacances Les Hauts Bois in Plagne Centre: Your adaptive ski equipment can be stored in a secure room made available by the accommodation. Access to the slopes is very simple – you go through the building (and up a small step) straight onto the snow-front where lessons begin. The accommodation is well equipped and adapted, comfortable and affordable. There is underground parking and a swimming pool and a spa accessible to wheelchair users. The pharmacy’s delivery service is a real plus (mentioned in a TripAdvisor review in 2014). Les Balcons de Belle Plagne: You can access the piste straight from the bottom of the building and the ski room is just next to the slope. The restaurant is also easily accessed and there is no need for a car. Oxygene Immobilier, a local property agent, has some great quality properties able to accommodate travellers in wheelchairs. They are situated around the La Plagne villages, sleep 4-18 guests and there is something to suit all budgets. In Plagne Soleil, the Mont Soleil residence is located at the bottom of the slopes. It is well equipped and includes a ski locker, a lift and a bath (although it doesn’t have a microwave). It costs from 384€ per week for up to 4 people. The Magic Bastos association also has an apartment available to rent located in Plagne Soleil in the Drus building which is accessible to disabled guests. From there you have direct access to the slopes, restaurants, shops, the lift pass office and Spar supermarket. Access to the apartment is via a lift from a covered car park. The apartment isn’t yet adapted to all disabilities but it is spacious and has a bath. 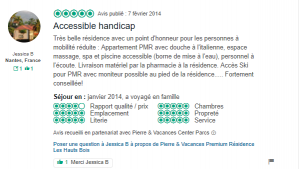 There are many other hotels and apartments suitable for disabled visitors such as the Araucaria and Vancouver hotels, the Front de Neige residence in Plagne Soleil (which is also recommended by Planet Handisport) and the Club Med in Aime 2000. If you’re taking ski lessons with Oxygene we recommend you stay either in Plagne Centre or Belle Plagne in order to make it as easy as possible for you to get to your lessons. There are plenty of playgrounds for adaptive skiers in La Plagne. Whether you are a confident skier looking to progress autonomously on your sit-ski, a beginner sit-skier or even if you’d like to cruise the slopes on a taxi-ski piloted by a ski instructor, Oxygene has an option for you. We truly believe that skiing should be accessible to all and have plenty of experienced and passionate instructors who are ready to help you. Our transport team are also on hand to transport your equipment and to help you get to and from the ski lesson meeting point. Having adaptive ski professionals who understand your every need is what makes all the difference. 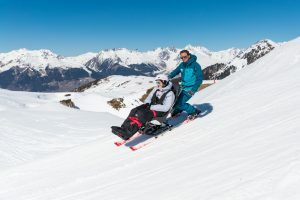 Adaptive skiers in the Paradiski area also receive a discount of up to 50% off their lift passes depending on their disability and the resort they are in (La Plagne, Peisey Vallandry or Champagny en Vanoise). Their companions can also receive certain discounts (although it’s best to check with the lift companies for these). On the slopes you will also find wheelchairs available for use in the public toilets and in certain slope-side restaurants. This initiative, led by Julien Favre, is supported by the resort who continue to add more and more wheelchairs to the ski area. Those that are already equipped include Les Inversens, Le Petit Chaperon Rouge, Le Chairlift, Le Roc des Blanchets and La Face Nord. In 2014 three disabled sports associations all came to La Plagne to ski together (Magic Bastos, Planet Handisport and Hand Sport Racing) and booked a Moonlight Ski evening for their participants. You can see the video of this incredible week in which a hundred sit-skiers all skied together. Depending on your disability you could also try night sledding with Oxygene, snow-scooting with Les SnowPanthers in Plagne Centre or dog sledding with Hors Traces Aventures. For blind or deaf visitors our snow-shoeing excursions are the ideal opportunity to try something new and relax whilst taking part in a gentler physical activity. The bobsleigh in La Plagne is also adapted to the majority of people with disabilities. Contact our office for more information. Numerous disciplines fall under the adaptive ski banner, find yours in relation to your disability and aspirations. The big advantage of a resort like La Plagne for wheelchair users is the commercial centre in Plagne Centre which gives you access to all of the shops and the majority of the restaurants which are happily located indoors in a long shopping centre building with lift access between the floors. Aime 2000 has a similar set up which is linked to the slopes via the Telemetro meaning to you don’t have to leave the building and struggle across the snow or on slippery pavement in your wheelchair. For the gourmets amongst you we recommend La Face Nord in Belle Plagne. Positioned on the snow-front, this restaurant is accessible from the slopes. For a lunch break on a sunny terrace, the Carlina lovely cuisine will satisfy you, as well as the animated snack Croq Neige or even the traditionnal dishes of the Chairlift restaurant. For a crepe and hot chocolate stop with an impressive view, you can expect a warm welcome at Les Inversens. Have we forgotten anything? Get in touch with our office in La Plagne. Our team are experts in adaptive skiing, know your needs and will be happy to help you. CAN I SKI IN APRIL?